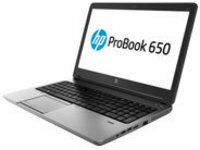 Take on tasks in the office or on the road with a durable HP ProBook 650. These ProBooks are thin, light and packed with productivity features to make work faster and easier. Plus, reliable security solutions keep your data out of the wrong hands. Get the technology you trust from HP, with cutting-edge style that looks and feels the way you want. Join forces with the latest generation technology and legacy features your business demands on a thinner HP ProBook for in the office or on the go. Protect existing IT investments with support for existing legacy features such as an optical drive, VGA and RJ45 connectors.